Isolated tricuspid regurgitation (TR) can be caused by primary valvular abnormalities such as flail leaflet or secondary annular dilation as is seen in atrial fibrillation, pulmonary hypertension and left heart disease. There is an increasing recognition of a subgroup of patients with isolated TR in the absence of other associated cardiac abnormalities. Left untreated isolated TR significantly worsens survival. Stand-alone surgery for isolated TR is rarely performed due to an average operative mortality of 8%–10% and a paucity of data demonstrating improved survival. When surgery is performed, valve repair may be preferred over replacement; however, there is a risk of significant recurrent regurgitation after repair. Existing society guidelines do not fully address the management of isolated TR. We propose that patients at low operative risk with symptomatic severe isolated TR and no reversible cause undergo surgery prior to the onset of right ventricular dysfunction and end-organ damage. For patients at increased surgical risk novel percutaneous interventions may offer an alternative treatment but further research is needed. Significant knowledge gaps remain and future research is needed to define operative outcomes and provide comparative data for medical and surgical therapy. More than 1.6 million Americans have at least moderate to severe tricuspid regurgitation (TR), yet fewer than 8000 tricuspid valve (TV) operations are performed annually in the USA.1–3 The aetiology of TR is divided into primary and secondary causes. Historically, primary TR was thought to be limited to patients with congenital heart disease and rarely observed in adults. Secondary TR is associated with pulmonary hypertension (PH), left-sided valvulopathy or myocardial disease. However, there is an emerging population of adult patients without left-sided heart disease, PH or congenital abnormalities who nonetheless develop symptomatic isolated TR. The incidence of isolated TR appears to be rising along with the prevalence of atrial fibrillation (AF) and intracardiac devices.4–6 This has prompted interest in corrective therapies; however, existing guidelines do not fully address management. In this article, we examine the natural history, presentation and evaluation of isolated TR. Next, we review surgical guidelines, evaluate postoperative outcomes and propose a management algorithm for isolated disease. Finally, we discuss percutaneous devices and address areas for future research. Secondary TR results from annular dilation and leaflet tethering leading to malcoaptation (figure 1, online supplementary video 1). Secondary TR commonly develops in response to right ventricular (RV) remodelling due to PH, which is the final common pathway of both intrinsic pulmonary vascular disease and left-sided myocardial or valvular disease. 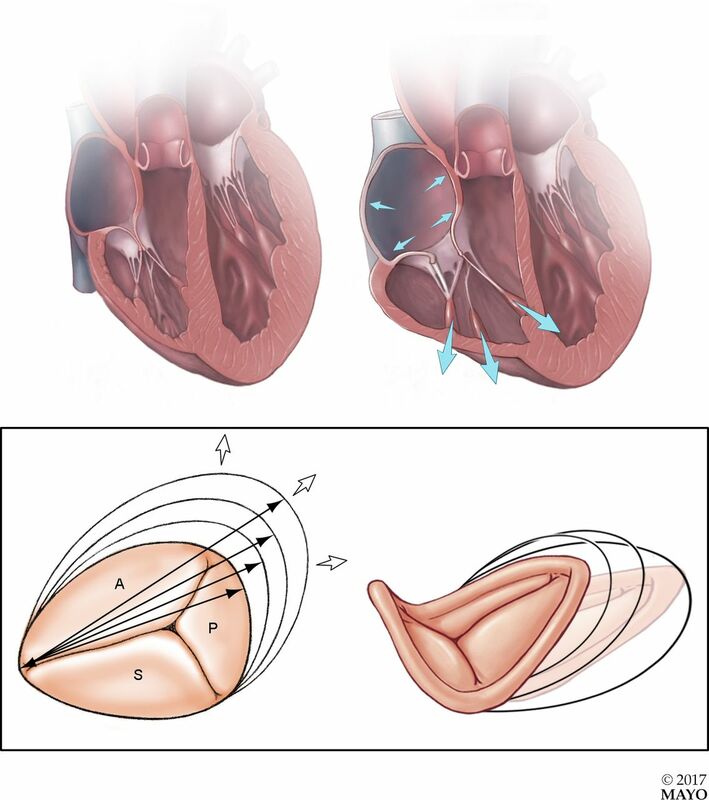 The resultant pressure overload causes ventricular enlargement, papillary muscle displacement, leaflet tethering, and annular flattening and dilation (figure 2). A similar pattern of secondary TR occurs in diseases of the myocardium where RV dilation is the dominate mechanism, such as with dilated cardiomyopathies, RV infarction and arrhythmogenic RV dysplasia. Chronic volume overload of the RV can also cause secondary TR, as it occurs with intracardiac shunts or high-output states. In about 10% of secondary TR no cause of the regurgitation can be identified, which has been termed ‘idiopathic’ TR.5 8 Patients with idiopathic disease tend to be older with a high prevalence of AF.8 10 Echocardiographic studies of idiopathic TR in patients with AF have identified extreme annular dilation as the driving mechanism, suggesting AF may be a cause rather than a consequence of the TR.10 Figure 3 outlines the aetiologies of primary and secondary TR. We discuss herein isolated TR in the absence of other aetiological factors. (Online video): Echocardiographic evaluation of severe tricuspid regurgitation. Panel (A) demonstrates right ventricular and atrial enlargement with subsequent leaflet malcoaptation. 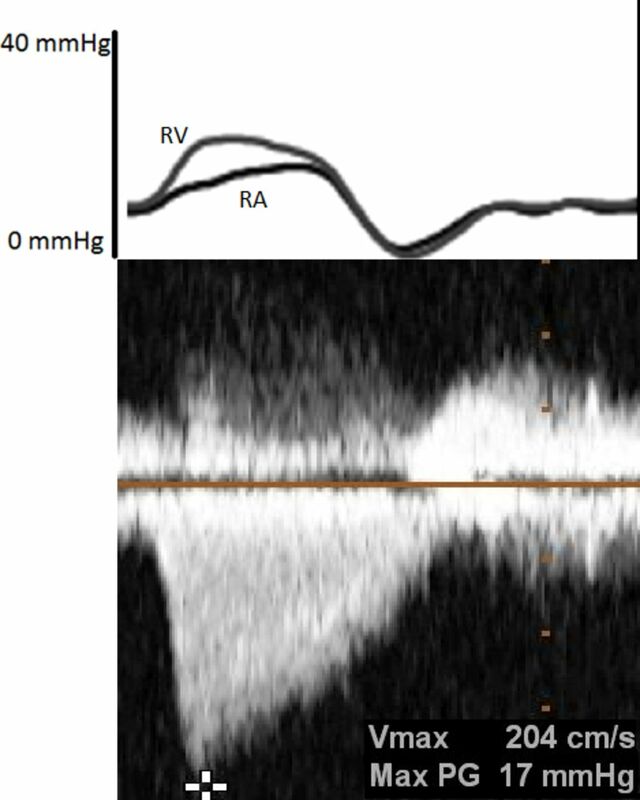 Panel (B) shows a broad-based regurgitant jet across the tricuspid valve by colour-flow Doppler. Panel (C) highlights the classic ‘dagger-shaped’ continuous wave Doppler pattern of the regurgitant jet which results from rapid pressure equalisation in the right atria and ventricle. Panel (D) demonstrates the continuous wave Doppler pattern of systolic reversals observed in the hepatic veins. Secondary tricuspid regurgitation is typically mediated by right ventricular and annular dilation with resultant flattening of the normal ‘saddle-shaped’ configuration of the tricuspid valve. The aetiology of tricuspid regurgitation can be divided according to the presence or absence of organic valvular disease. Patients with isolated primary or secondary tricuspid regurgitation (highlighted in the red boxes) represent an emerging patient population about whom little is known. AF, atrial fibrillation; ARVD, arrhythmogenic right ventricular dysplasia; AV, aortic valve; DCM, dilated cardiomyopathy; L TGA, L-transposition of the great arteries; RV, right ventricle. The presentation of isolated TR is characterised by the physical finding of an elevated venous pressure with systolic pulsatility indicating a high right atrial (RA) pressure and large C-V wave. This is followed by development of right heart failure (neck fullness, hepatomegaly, oedema and ascites) and low cardiac output (fatigue). Exertional dyspnoea results from enhanced ventricular interaction with the dilated RV causing poor effective operative compliance of the left ventricle (LV).11 Hepatic and renal failure results from venous congestion and low perfusion pressure.12 13 Patients with isolated severe TR will present with right heart failure despite normal LV systolic function, left-sided valves and pulmonary pressures. Similar findings occur in constrictive pericarditis and restrictive cardiomyopathy, which must be considered in the differential diagnosis. A history of long-standing AF or a prior intracardiac device should raise the suspicion of severe isolated TR. 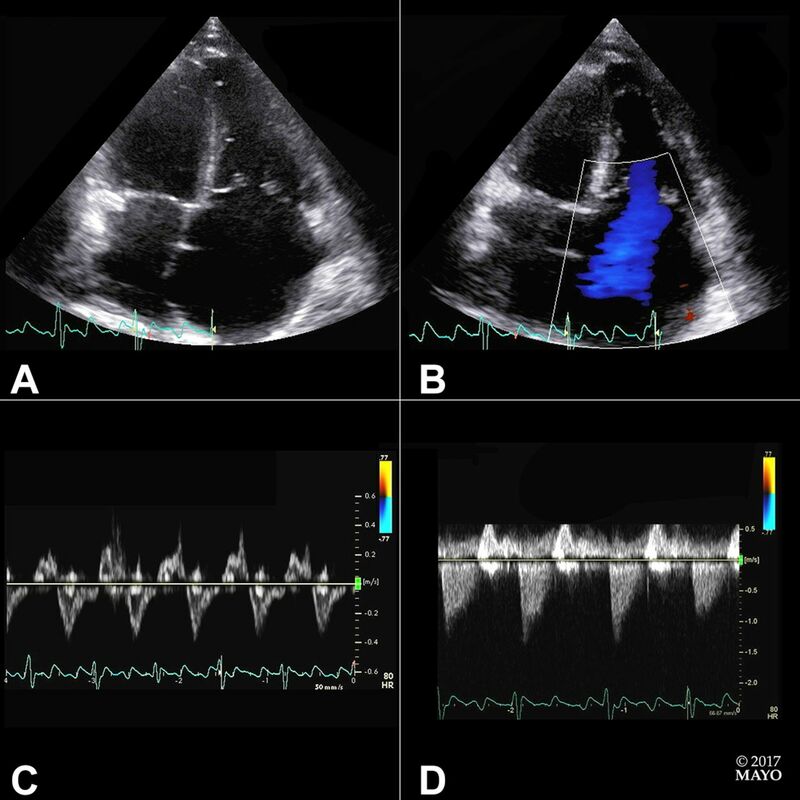 Simultaneous measurement of the tricuspid regurgitation jet by continuous wave Doppler and haemodynamic catheterisation demonstrates several key findings. Severe regurgitation results in rapid pressure equalisation between the right ventricle and right atrium giving the continuous wave Doppler signal a ‘dagger-shaped’ appearance. Additionally, the peak regurgitant velocity is low, which excludes significant pulmonary hypertension as a cause of the regurgitation. The haemodynamic tracing is notable for ventricularisation of the right atrial tracing, and marked elevation of the right atrial pressure with a large C-V wave. RA, right atrium; RV, right ventricle; PG, pressure gradient. The clinical impact of TR was first established in patients with significant left-sided heart disease where the presence of TR worsened survival.18 The importance of isolated TR was first described in 2004.4 In a cohort study of 5223 patients, the presence of severe TR was associated with decreased survival after adjustment for PH and ejection fraction (HR 1.31, 95% CI 1.05 to 1.66). In a series of 60 patients with isolated flail, an excess mortality of 3.8% per year was observed (P=0.02).19 In an observational study of patients with new TR following cardiac device implantation, ≥2+ TR was independently associated with all-cause mortality (HR 1.75, 95% CI 1.01 to 3.02, P=0.047).9 Similarly, a 2014 study of 68 subjects with isolated severe secondary TR demonstrated worse long-term survival (HR 2.67, 95% CI 1.66 to 4.23).5 These series indicate that even in the absence of significant cardiopulmonary comorbidities, isolated TR adversely impacts survival. Most patients with symptomatic TR are managed with therapies targeted towards the underlying disease process and diuretics to address volume overload.20 While diuretics may temporise symptoms, it is unclear if they alter disease progression, particularly in patients with primary valve disease. Therefore, TV surgery is the definitive therapy for severe symptoms. Current guidelines for surgery are reviewed in table 1.20 21 Most recommendations are targeted at patients undergoing concomitant aortic or mitral operations. These recommendations are based on the findings that the size and configuration of the TV will not reliably return to baseline after relief of RV overload.20 Furthermore, reoperation for isolated TR after previous sternotomy is associated with significant in-hospital mortality.22 There is a paucity of recommendations for surgery in patients with isolated TR. Existing recommendations are based on limited data in young otherwise healthy patients with primary TV flail.19 However, patients with flail are fundamentally different from those with isolated TR due to a device lead or idiopathic secondary TR associated with AF. These latter patients tend to be older with more comorbidities. Due to a lack of outcomes literature, the management of isolated TR is not directly addressed by current guidelines. The selection of a valve repair versus replacement is largely driven by anatomic factors, including the extent of leaflet damage and degree of annular dilation. When feasible, valve repair may be preferred due to the risks of prosthetic valve thrombosis, bioprosthetic valve degeneration and long term anticoagulation.23 24 Repair is generally favoured in patients undergoing left-sided surgery as these techniques can be accomplished quickly to minimise bypass time.20 25 It is estimated that 73% of TV operations are repairs, with 88% performed at the time of left-sided valve surgery.1 The most common surgical techniques are reviewed in figure 5. 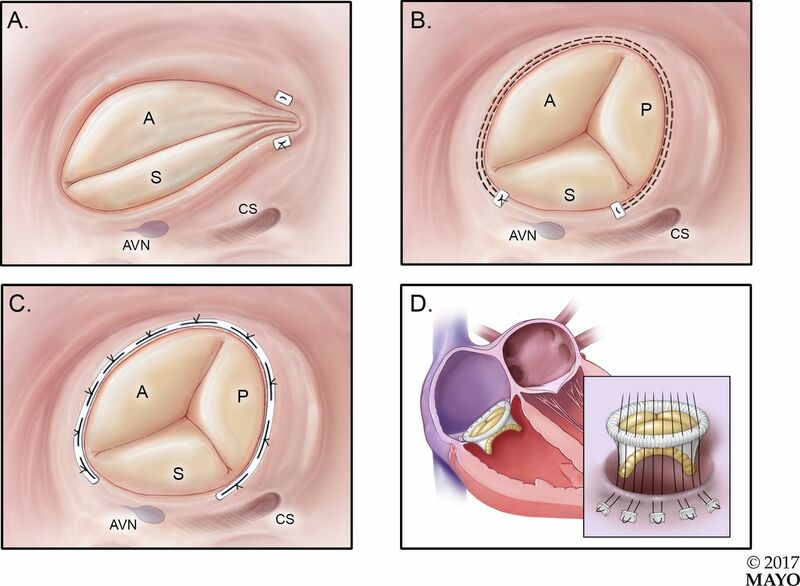 The most common tricuspid valve operations include the Kay bicuspidisation (A), DeVega suture annuloplasty (B), prosthetic annuloplasty band (C) and tricuspid valve replacement (D). AVN, atrioventricular node; CS, coronary sinus; A, anterior leaflet; P, posterior leaflet; S, septal leaflet. The choice of bioprosthetic versus mechanical valves has generated much debate. Bioprosthetic valves in the tricuspid position may be more durable than bioprosthetics in the mitral position, perhaps due to lower pressures and velocities.32 Advantages to bioprostheses include a lower risk of valve thrombosis and avoidance of anticoagulation; however, there is up to a 7% risk of severe bioprosthetic degeneration at 7–8 years requiring stand-alone redo TVR.33 34 Conflicting data have been published on long-term outcomes, with survival being similar, worse or improved with a bioprosthesis versus a mechanical prosthesis.35–38 Overall, there is no definite survival benefit of a mechanical versus a bioprosthetic valve. The final choice should be a shared decision between the patient and the physician. However, in older patients the lower rate of structural deterioration and possible future need for a pacemaker favour a bioprosthetic valve. Regardless of which series is examined, outcomes of TR surgery are worse than what is seen in mitral or aortic operations. Surgical mortality may be adversely impacted by the practice of delaying operative interventions, thereby allowing for the development of RV dysfunction and end-organ damage. For the aortic and mitral valves, the timing of surgical referral is based on an integration of symptoms, disease severity and early markers of LV dilation or dysfunction.20 There are little data to base timing of surgery for patients with severe TR, particularly those with isolated disease. Several studies have examined the relationship between RA pressure and RV function with outcomes in patients undergoing TR surgery. An analysis of 260 patients treated surgically for secondary TR (the majority of whom underwent combined left valve surgery) found RA pressure was independently associated with hospital death (HR 5.6, 95% CI 1.7 to 78.0, P=0.01), with a mortality rate of 28% for patients with a preoperative RA pressure ≥15 mm Hg versus just 5% in patients with a pressure <15 mm Hg.47 RV dysfunction represents an advanced stage of chronic TR. In patients undergoing stand-alone TR surgery, RV end-systolic dimension, RV end-systolic area and the RV index of myocardial performance have all been associated with survival free of death, heart failure, cardiac readmissions, heart transplant or TV reoperation.5 39 40 These findings suggest RA pressure and RV function are key determinates of postoperative outcomes. As with all surgeries for valve disease, severe symptoms are associated with adverse short and long-term outcomes. ‘Severe TR begets severe TR.’ Progressive RV dysfunction drives further annular dilatation and results in more severe TR. Diuretics may be effective in treating right heart failure in the early stages of isolated secondary TR and may potentially interrupt this cycle by lowering RA pressure. Medical therapy will not reverse progressive RV dysfunction in severe isolated primary TR. Isolated secondary TR associated with AF may improve with conversion to sinus rhythm. Once severe right heart failure symptoms develop, if the TR remains untreated there is progressive clinical deterioration with development of end-stage liver and kidney failure. Surgical intervention can improve the symptoms of right heart failure, but there are no data on enhanced survival in patients with isolated TR. The current high mortality associated with surgery for isolated TR may be in part related to late surgical referral at which time severe RV dysfunction and end-organ damage have already occurred. Our recommendations for treatment of patient with severe isolated TR are shown in figure 6. 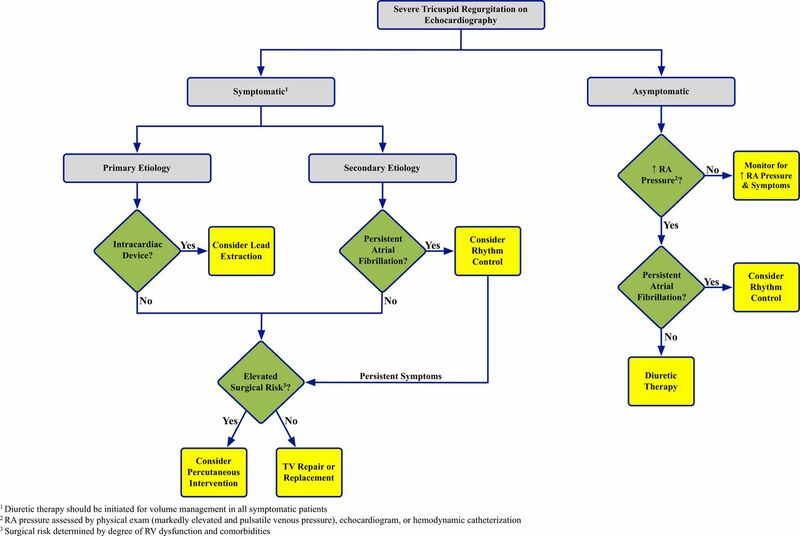 Algorithm for the management of severe isolated tricuspid regurgitation. RA, right atrium; RV, right ventricle; TV, tricuspid valve. In patients without right heart failure symptoms surgical intervention is not recommended. However, it is reasonable to try diuretics if RA pressure elevation is seen on examination as diuretics may interrupt the cycle of ‘severe TR begets severe TR.’ Conversion to sinus rhythm may decrease the severity of TR in patients with persistent AF. It is those patients with severe isolated TR and right heart failure who should be considered for surgical intervention. For patients with severe primary TR (frequently associated with intracardiac leads), surgical intervention may be indicated as this represents a structural problem which diuretics will not address. There have been reports of successful treatment of TR with lead extraction.7 However, in most cases the exact mechanism of the device-induced TR is unclear, and lead extraction could further damage the valve. Our current approach is surgical repair or TVR with exteriorisation of the lead outside the valve ring. In patients with isolated secondary TR an attempt to reduce annular size with diuretics or conversion to sinus rhythm for those with persistent AF may be effective. If symptoms remain surgical intervention is recommended prior to the onset of severe RV dysfunction, hepatic or renal dysfunction. Whether surgery may be effective at an earlier stage prior to the onset of symptomatic right heart failure remains to be determined. The rarity of surgery has created a large population in whom percutaneous treatments could provide a viable alternative. No large experience exists for these devices but early studies are under way. Devices fall into two categories: transcatheter valves and coaptation devices48 (figure 7). Transcatheter valve replacement is usually performed within a previously placed bioprosthetic valve (‘valve-in-valve’), or as a stented valve implanted in the inferior vena cava and superior vena cava.48 49 Devices aimed at improving coaptation include off label use of the MitraClip (Abbot Vascular, Menlo Park, CA), a percutaneous annuloplasty system (TriAlign, Mitralign, Tewksbury, MA) and a spacer device (FORMA Edwards Lifesciences, Irvine, CA), which occupies the regurgitant orifice. The extent to which these devices result in a clinically meaningful improvement is not established and requires further research before these techniques can be adopted into clinical practice. Multiple percutaneous devices are in development for the treatment of tricuspid regurgitation. Panel (A) is the FORMA device, a tricuspid spacer which occupies the regurgitant orifice and provides a surface against which coaptation can occur. Panel (B) demonstrates the TriAlign, which percutaneously reproduces a surgical Kay bicuspidisation. Panel (C) shows the MitraClip being used in the tricuspid position. Panel (D) demonstrates a stented caval valve implanted in the inferior vena cava. Our understanding of the management of isolated secondary TR is lacking in three key areas: identification of patients for surgical intervention, isolated TR surgical outcomes in the contemporary era and comparative survival analyses for medical and surgical patients. Preoperative RV size and function are associated with postoperative outcomes; however, threshold criteria for valve intervention are lacking.20 Similar to what is seen in the LV with mitral regurgitation, severe TR may mask early RV dysfunction. Overt RV dysfunction represents an end-stage condition and the prognosis cannot be altered surgically. Therefore, identification of echocardiographic markers of early RV dysfunction are needed to guide surgical referral. Similarly, our understanding of surgical outcomes in patients with isolated TR is limited. Most series contain a heterogeneous population treated over decades and therefore have limited generalisability. Surgical referral for isolated TR is often delayed until the onset of frank right heart failure with end-organ damage which then further increases perioperative mortality. Efforts to define operative risk for truly isolated disease are critical to aid in decision-making, and to act as a benchmark against which studies of early operation can be compared. A final, but major, limitation of existing surgical data is the paucity of comparative outcomes. Upfront operative mortality is high. Therefore, establishing long-term survival relative to medical therapy is critical to understanding the risks and benefits of surgery. A randomised trial of early surgery for isolated TR would fill an important gap in the literature. Isolated severe TR results in progressive right heart failure and adversely impacts survival. Surgery remains the only definitive treatment but is rarely performed. There are little data to guide management of isolated TR; however, surgery is reasonable in patients with right heart failure who are at low operative risk prior to the development of RV dysfunction and end-organ damage. Further research is needed to identify markers of disease progression and to aid in the optimal timing for surgical referral.
. Carpentier’s flexible ring versus De Vega’s annuloplasty. A prospective randomized study. J Thorac Cardiovasc Surg 1985;89:196–203.
. Isolated tricuspid valve surgery for severe tricuspid regurgitation following prior left heart valve surgery: analysis of outcome in 34 patients. J Heart Valve Dis 1999;8:567–74. Contributors All authors have substantially contributed to the writing, research and design of this commissioned review. EAF and CJZ performed the literature review, writing of the manuscript, table and figure design. RAN contributed substantially to the design, writing, concept and structure of the manuscript.